Welcome to the Eastbourne fishermen's website, here you will find a selection of news, views and information that involves all aspects of the Eastbourne fishing fleet. As a group we are always keen to be an integral part of the community in which we work and we hope that this website will become a portal for discussion and communication on all aspects of the past, present and future of your local fishing fleet. 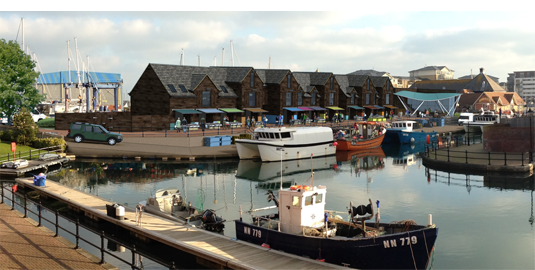 Local fishermen have recently formed a Community Interest Company (CCI) in order to be able to purchase and work from the land behind The Harvester at The Waterfront, please see the architects plan below. Our hope is to be able to develop this land and create a Fishermen's Quay, consisting of traditional net huts, wet fish sales, offices, workshops and a 'learning centre'. The plans are currently being considered by all relevant parties.